Mark Smith with his 13lb 1oz barbel. With all this water about and the River Nene just about managing to keep the flow within its banks it was no surprise to hear of the odd barbel or two being taken. Despite the coloured water, a strong smelling bait is well worth a try as club bailiff Mark Smith found out. He caught the best barbel of the year so far from the Castor area going to the scales at 13lb 1oz. He caught it just before the light faded, which is the prime time at the moment as the better fish seem to feed at this time of the day. Make the most of it though as once the really cold weather sets in and the river goes clear it’s sure to be tough going. 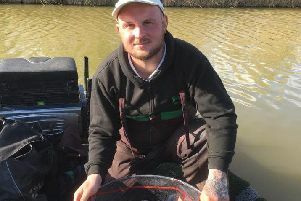 Jason Fulcher took the honours in the Saturday Open on the Magpie Pool at Rookery Waters. He caught 26 carp on red maggot for 90lb 10oz. Second was Geoff Arnold with 58lb 4oz, followed by Dave Rawlings with 52lb 12oz. In the Wednesday Over 60s match all the locals filled the frame topped by Kevin Peacock, who fished soft pellet micros to put a fine 80lb 2oz to the scales. Then came John Belshaw with 39lb 14oz and Will Hadley on 32lb 8oz.